Will Smog Darken China's Debutante Ball? A miasma of soot and smog sits over Beijing. Photo by +212. “Should I run behind a bus and breathe in the exhaust? Should I train on the highway during rush hour? Is there any way to acclimate myself to pollution?” These are just a sampling of the strange questions that exercise physiologist for the United States Olympic Committee Randy Wilber has fielded from American athletes anxious to turn out a top-notch performance in Beijing this August, according to a recent New York Times article. According to Chinese officials, such worries are unfounded. They believe that Beijing will boast blue skies during this summer’s Olympics, when China will openly flex its superpower muscles for the entire world to admire. Unfortunately, Beijing’s plans for creating blue skies rely on a tremendous, temporary green washing of the city – drastic limits on vehicle use and factory closings. 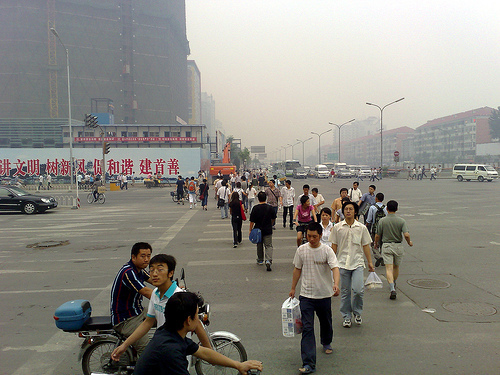 The New York Times article points out that pollution levels in Beijing typically reach five times the World Health Organization standards for safety. Athletes competing in Olympic test events last summer reported contracting respiratory infections and coughing up black mucus. If China’s temporary fixes don’t produce blue skies in Beijing, athletes’ bodies’ may react to extreme air pollution levels by reducing air intake, leading to oxygen debt and cramps. Athletes may also experience allergic reactions. In the worst-case scenario, extreme pollution may lead to heart attacks in even the fittest of athletes. While the best thing for China, Beijing, the Olympics and the world’s top athletes is for temporary clean air measures to succeed, perhaps it would be best for the environment if the world had a chance to see the negative health effects of air pollution on some of our most beloved modern-day heroes – our athletes. Even if China manages to clean up Beijing’s air, the point about air pollution may still be made clear. American athletes plan to show-up in Beijing wearing carbon filtration masks. This may ultimately insult Chinese officials and citizens; however, athletes willing to train on the highway during rush hour and breath bus exhaust while running will not hesitate to garner any advantage permitted under Olympic regulations.